I must admit that it was the first time in my life that I was going to go and willingly see a metal festival where 3 out of 4 bands had female singers and were in the symphonic-atmospheric genre! 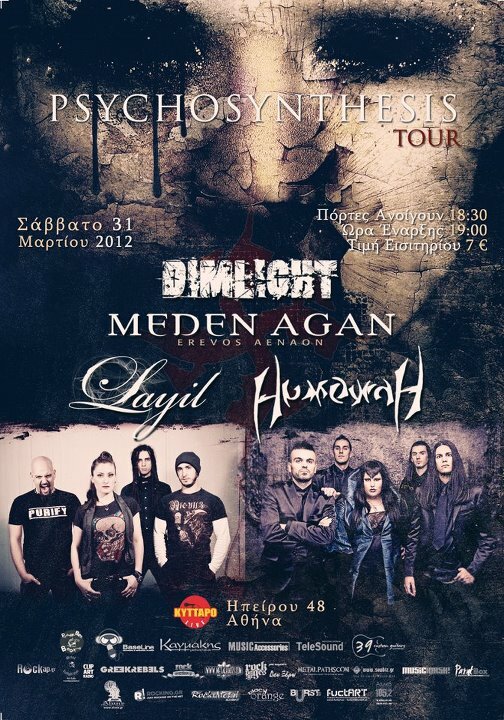 I’m not a big fan of symphonic metal, I only like certain bands but I really wanted to see Dimlight and Meden Agan, they are 2 very good bands that you don’t see live very often. And now was the time! The gig started around 19.30 and the first band on stage was “Layil”, an interesting and experimental band who despite the fact that they’re newcomers and they obviously have a lack of live experience, did a really great job of warming the crowd and played some very good songs. I’m not very familiar with their style, but I think that if they stick to a certain musical route and chop off some extra experimentations that they have, we’re gonna be hearing from them in the future. The second band was “Humayrah” and they had the most different style of all the other bands. They sounded a lot like “aggressive 90s Sepultura” witch got many people banging heads and moshing around almost instantly. They have a groovy thrash style with some death metal elements and they seem to have worked on their songs a lot, because the overall outcome was way beyond good. More people started entering the venue while the band played, and the atmosphere was getting a lot warmer. It was finally time for Meden Agan. The crowd was going really wild now and you can tell that many people were here to just see them giving their best. The band started playing and hell broke loose. They played a lot of songs from their record “Erevos Aenaon” along with some covers. The band is extremely tight, a thing you rarely see in a new band and they already have an emerging hype around their name. The minor sound problems didn’t stop the band from giving its best self and the singer Iliana from showing her unique singing abilities. Her stage presence is also very good, and that goes for the rest of the band, a thing you rarely see in most bands nowadays. She sang every tune perfectly while keeping the communication with the crowd alive at all times. Most people knew the songs already and I also saw some people opening a pit (!) a really weird thing to see during the gig of a symphonic metal band. I must mention here the awesome cover that they made in the song “Somewhere” from another favourite band of mine, Within Temptation, with the help of Maxi Nil. 2 great voices performing a great song of the genre, what more can you ask for? They definitely were my favourite band of the festival; I can’t wait to see them again soon. Dimlight was about to hit the stage and the sound starting having problems again. The band has played many shows in Greece and abroad but sadly I’ve never had the chance to see them. They mostly played songs from their upcoming record “Psychosynthesis” and I can definitely say that it was like seeing a big band somewhere in a stage in Europe. They had definitely worked a lot on their stage appearance and they also had a very good show planned ahead which left the crowd speechless. Some minor sound problems appeared again but no one seemed to mind because the bands performance was excellent. I must admit that I surely wasn’t expecting such a good overall show from them. The show continued with some nice fire effects and a guest appearance by Iliana from “Medan Agan” who gave another excellent performance in the song “Mind’s Game” alongside Sanna. Even during the Dimlight gig people still kept coming and I’d say that there must have been nearly 300 people or more by the end of the night who attended. After the end of the show a lottery was made were some fans won cds, t-shirts and a guitar. Overally the show was very close to perfect, the bands played great, the price was great and a lot of people attended. I’m very glad I was there and I definitely wish that we get the chance to see festivals like this more often in the future.